Back in February 2013, we wrote a blog post about the treats of our local bakery. Our local bakery has changed hands many times – it’s difficult for them to make enough money – but the recent owners are hanging on in there. We always try to support our local businesses anyway, but our bakery attracts us for its extra treats such as the börek we wrote about in that last post. Recently, they’ve added a few new treats to their repertoire; kurabiye, pide and simit often make an appearance if you get there at the right time. That’s the attraction for us; you never know what’s going to be sitting behind that glass counter when you walk through the door. Yes, our local bakery’s lavaş ekmeği (lavash bread) is attracting us to their shop on a regular basis and this situation isn’t helping our waistlines one bit! Well, just look at it. This photo doesn’t really show you the size of the lavash bread, but it’s about 1 metre long and 20 cm wide and, when you buy it, the shop assistant folds it into four and places it in a carrier bag for you. Sometimes, it’s still warm. And then, when you’re walking home with it, you can’t resist but tear little chunks off to munch on as you stroll. Fortunately, the walk between the bakery (fırın) and our house isn’t too long, otherwise we’d probably munch through the whole length of lavash bread before we get home! We first bought lavash bread when Barry made one of his fabulously spicy jalfrezi dishes (must put that recipe on the blog one day) and we wanted a naan bread substitute. Stud your lavash bread with little bits of garlic butter, warm it in the oven for a minute or so and you’re away. Turkish lavash bread is central to so many Turkish dishes. 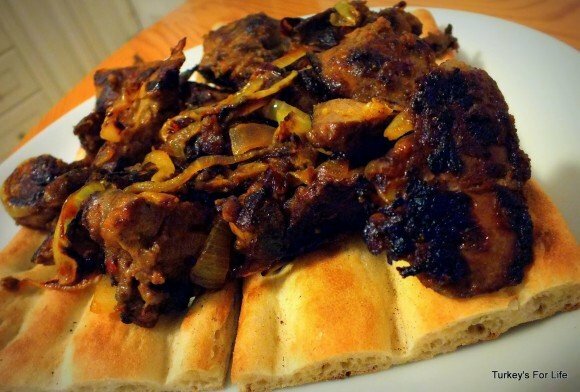 If you’ve been wondering about other ideas for how to serve lavash bread, it makes a perfect base for şiş kebab, döner, köfte and, as in the photo above, fried liver. You know we love our ciğer şiş. The photo above is slightly different because it’s chicken livers coated in flour and flash fried with onions. Place them on top of your bread and serve with a side of bulgur pilaf and süzme yoghurt. Bliss. We usually make some creations with our yoghurt, too…a few chilli flakes, a bit of garlic, a light pinch of dried mint; whatever we feel like. Of course, lavash bread is also used for your traditional Turkish dürüm kebabs, too. 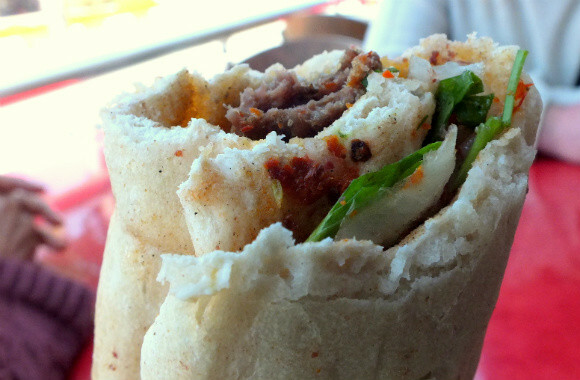 You know, that wrap you get filled with allsorts of meaty treats and salads, or even çiğ köfte. Sometimes it’s the very flat lavash bread and other times, it’s slightly thicker like the one from our local bakery and this great value dürüm at Çalış Kebabs & Dürüm. 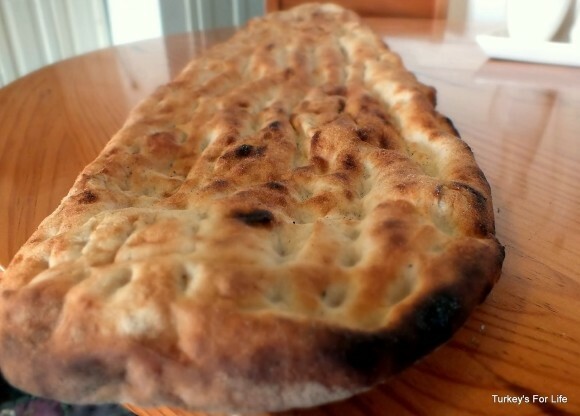 How to eat lavash bread – How about a pizza? We looked in the fridge. We had a bit of Izmir tulum cheese left over and a jar of salted sardines. It just screamed pizza. We also use lavash bread for dipping in soup, as a side to meals, as an accompaniment to meze dishes – it’s a staple of our menu, now. And just a tip: as with other Turkish breads from your local bakery, there are no preservatives in lavash flat bread. This means it goes like leather the day after. However, never fear. Heat your oven to 100 degrees and place it in for no more than a minute. Voila, you have beautifully warm, soft and fresh lavash bread again, as if it has just been baked. If you’ve got any other creations and ideas for what to do with lavash bread, we’re all ears. We’d love you to share your ideas with us in the comments below. Wow, those breads look good – not unlike a low-fat pizza. I still have sinful dreams about the köy ekmek some women baked outside their houses in a village near Antalya 20 years ago. It was clearly unforgettable. Have you tried Çökertme kebab? Another good use of flat bread. Bread is our big downfall, Özlem…not easy to resist, living in Turkey. 🙂 Enjoy your indulgence.